5. 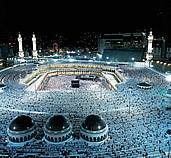 The pilgrimage to Makkah for those who are able (Hajj or Pilgrimage). Salah is the name for the obligatory prayers that are performed five times a day, and are a direct link between the worshipper and God. There is no hierarchical authority in Islam and there are no priests. A learned person who knows the Qur’an and is generally chosen by the congregation leads prayers. The call for prayer is called Ezan (Adhan, Azaan, Athan). An important principle of Islam is that everything belongs to God, and human beings in trust therefore hold that wealth. The word zakah means both "purification" and "growth." Setting aside a proportion for those in need and for the society in general purifies our possessions. Like the pruning of plants, this cutting back balances and encourages new growth. Every year in the month of Ramadan, all Muslims fast from dawn until sundown-abstaining from food, drink, and sexual relations with their spouses. The rites of the hajj, which are of Abrahamic origin, include going around the Ka'bah seven times, and going seven times between the hills of Safa and Marwa as did Hagar (Hajir, Abraham's wife) during her search for water. The pilgrims later stand together on the wide plains of 'Arafat (a large expanse of desert outside Makkah) and join in prayer for God’s forgiveness, in what is often thought as a preview of the Day of Judgment.